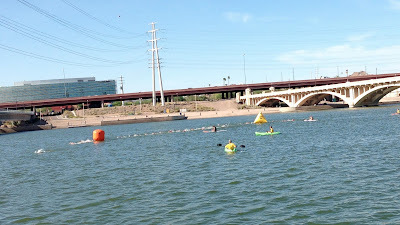 Yesterday morning I streamed Boston coverage from my computer while working and writing a blog on the fun and exciting weekend I had in Arizona watching a couple triathlons and supporting athletes. Then I took a quick break for a swim, and when I came back Boston had gone from one extreme to another. I first saw a tweet from Josh Cox mentioning the bombings, and I was half thinking it was just a mistake... but within minutes the news was pouring in and my heart sunk, tears literally filled my eyes. Why sport? Why that event? Why target something that exudes health, happiness, accomplishment and togetherness? I was in no mood to post my blog any longer. Seemed frivolous in light of everything. Then later in the evening I noticed one tweet in particular that really stuck with me. It was by my friend Ron aka @PunkRockRunner, and he said, "Days like today make me realize that running is actually a team sport. I'm proud of this team. Sending positive thoughts to Boston." So true. In light of this horrific tragedy, the team is proving to be strong, and there have been so many heroic stories and examples of people coming together to help one another in Boston. For the rest of us who aren't there, we're doing our best to show our support and help however we can. One of the best things you can do today is just get out there and run. Everyone is encouraging everyone to run... wear a race shirt when you do so... or just get out there and show the strength of our team! I also decided to still post this blog right now and not later. Doing so is not a sign of ignorance to the situation, but rather a way to show that our team is strong and that we are not afraid. We still will live our lives and do the things we love.... participate in sport, share the experiences, and be strong. They won't get the best of us! No way. So, this past weekend in Arizona. The "double triathlon" theme continued, thankfully this time as a spectator. Heck, I think I've broken some kind of record for triathlon attendance: Over the past three weekends (16 days), I made it out to five triathlons. 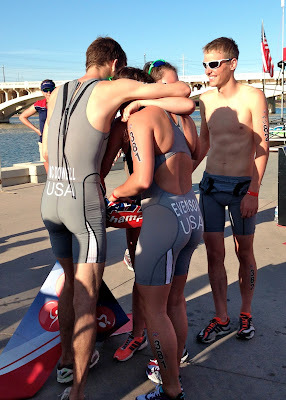 I was in Arizona for USAT Collegiate Nationals and the LeadmanTri 125. I mainly made the trip out to support my collegiate athlete, Lauren, who I've been working with for just over six months now. She's one of those endurance athletes who has a lot of raw, natural talent and a fierce competitive drive and who wanted a coach to guide her training and racing so she can legitimately explode into the scene, while still managing a demanding school load, and, well, college life. Collegiate Nationals was her first big race of the year, and I wanted to observe her in her element doing the swim-bike-run thang. Lauren and I before her race start on Saturday. A short but FAST 250m swim. Some strong leaders! Later that afternoon we watched the Collegiate Team Mixed Relays. Now this was some exciting and fast racing! Rumor on the street is that it's being looked at for a potential Olympic sport as early as Rio 2016. I would love that. The format is simple and really spectator friendly. There are teams of four; two girls and two guys. 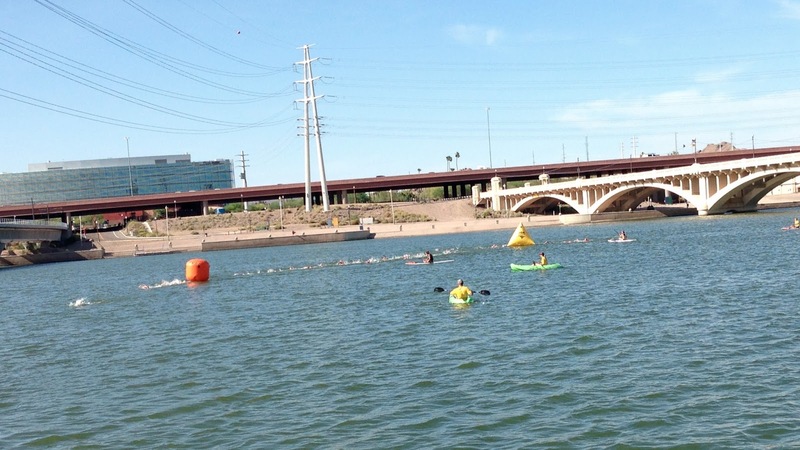 They race girl-guy-girl-guy in that order, each doing a 250m swim, 5k bike and 1.2k run. UCCS (Colorado) took the win, which was awesome to see, as the final leg for their team was Kevin McDowell, who many know by now is a stud triathlete not only for his talent in sport but for beating cancer. Then Sunday was the LeadmanTri 125, in the exact same spot as Nationals, but a longer course: 2.5k swim, 68-mile bike, 8-mile run. I was staying with two of the participants, ER and her man Tomas. They cracked me up because neither were that invested in the race, and let's just say their training had been minimal in the lead-up. Honestly, that situation would scare me more than toeing the line knowing you've done the hard work.That said, they both killed it! Natural endurance athletes I guess :) Plus, their finishing times were about 5 minutes apart, I think that's cute. Thank you for posting this Tawnee. It's fascinating how close to home the Boston attack hits every endurance athlete. And around the same time yesterday an earthquake in Iran killed roughly 40 people, but that doesn't have the same effect. Obviously the second one is a natural disaster, but man, there is so much devastation. Everything I think or do just seems superficial and silly. The best thing I saw yesterday was the number of people running towards the damage to help, it restored a bit of my faith in humanity.